PARIS, Jan 8 2015 (IPS) - “They are cowards who react to satire by going for their Kalashnikovs.” That was how renowned French cartoonist Plantu described the killers of 10 media workers and two policemen in Paris Wednesday. One of the murdered journalists, cartoonist Bernard Verlhac who went by the pen name of Tignous, was a member of Cartooning for Peace, the organisation that Plantu founded with former United Nations Secretary-General Kofi Annan in 2006, following the protests sparked by the controversial Danish cartoons depicting the prophet Muhammad. Tignous worked for Charlie Hebdo, the satirical French magazine that the murderers targeted. According to police and eyewitness reports, two hooded gunmen entered the premises of the magazine and opened fire in the late morning. After they fled the scene, in a car driven by a third participant, 12 people were confirmed dead and at least 11 injured, some critically. Video footage, filmed from neighbouring buildings, showed the attackers killing an injured policeman as he lay in the road. On Wednesday night, the police presence in France’s capital city was huge as security officials tried to track down the attackers who reportedly had been identified. French President François Hollande said in a public address that the killers would be brought to justice and “severely punished” for their actions. Appealing for unity, he said the attack was an assault on national ideals and freedoms, including freedom of expression. Meanwhile, many French residents took to social media to express solidarity with the magazine’s staff, posting images with the words “Je suis Charlie” (I am Charlie), and thousands gathered on the historic Place de la Republique in Paris, and in several other cities in France. The magazine had been a target for several years, since it published cartoons of the prophet Muhammad. In 2011, assailants firebombed its offices in the city’s 11th district, and its cartoons have been considered offensive by various groups over the past two years. Its cover this week featured the controversial French writer Michel Houellebecq, whose newly published novel “Soumission” portrays a future France living under an Islamic regime. But condemnation of the murders came from all sides of the religious and political spectrum on Wednesday. The French Muslim Council said the “barbaric action” was also an attack “against democracy and the freedom of the press,” while the Protestant Federation of France expressed “revulsion” and said the “hateful” acts could have no justification in any religion. EFJ president Mogens Blicher Bjerregaard stressed that journalists today face a greater range of dangers and threats than ever before. Last year, 118 journalists and media workers died for doing their jobs, according to the EFJ and other organisations, bringing the total to more than 700 deaths over the past decade. Charlie Hebdo’s recent cartoons had poked fun at the head of IS, or the Islamic State, and had even seemed to forecast an attack, saying that fighters had until the end of January to “present their wishes” – a reference to the French tradition of government ministers presenting their “voeux” to the press each new year. From around the world, condemnation of the acts and condolences for the victims’ families were transmitted to France by heads of state and foreign ministers. But perhaps the most profound messages came from colleagues in the media world – cartoonists. 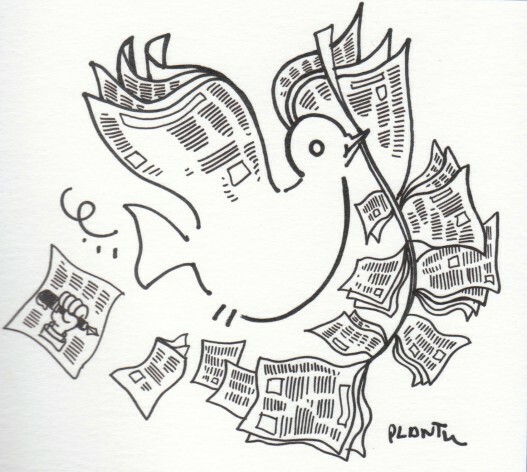 Plantu said that Cartooning for Peace, where staffers worked late into the evening, had received thousands of messages and drawings. He said that Cartooning for Peace had been created for the very purpose of creating bridges between people, religions and regions and that cartoonists’ work was “stronger” than the “barbaric acts” committed by the “cowards” on Wednesday. Plantu told IPS at a conference last year in the southern French city of Montpellier that the work of the non-profit organisation was important in promoting dialogue, understanding and mutual respect by using cartoons as a universal language. At that conference, one of the featured participants was Tignous, who showed himself to be funny in both speech and drawing. As he and a journalist got lost trying to make it to the conference centre, he cracked jokes about his legs being too short to jump fences, but he ended up being the one to find the right direction. Later at the conference, he produced cartoons that had the audience laughing out loud. For him, and other cartoonists, the work was about freedom to poke fun at extremists and political hypocrites. According to commentators, Charlie Hebdo may have inflamed passions with its satire, but the killings on Wednesday seemed an attempt to end all debate, and to foster further division in France, where the extreme-right National Front party has been rising in popularity.